Home What is Blotter Art? 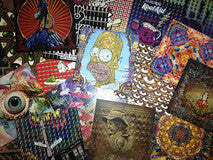 Click to see our extensive catalog of blotter art prints. Shakedown Gallery has a specific focus: We sell blotter art. Blotter Art is basically the artwork on blotter acid paper. The blotter art we sell can be described as "psychedelic art without psychedelic drugs on the paper" and blotter art collecting can perhaps be best understood as "stamp collecting for psychedelic enthusiasts." At Shakedown Gallery we pride ourselves on having one of the best collections of blotter art on the web, specializing in beautiful artist-generated signed editions unavailable anywhere else. Nevertheless, you may still be asking "What is blotter art? And how did blotter art collecting begin?" In the beginning, there was Mark McCloud. But while Mark McCloud didn't create the first blotter art print, he was most certainly the scene maker who first put blotter art collecting on the map. In the early days, blotter art could only be obtained with LSD already on it. McCloud bought these sheets, matted and framed them, and hung them like fine art. It was initially quite difficult for McCloud to collect the undipped (and hence legal) sheets of art, so he'd have to venture out into the underground and ask dealers if they could get him the same image on an undipped sheet. Initially, this was quite controversial -- "Is this guy a Fed or wacko?" -- But after a few high profile art shows and a couple high profile busts (for the paper, not the drug) Mark McCloud was cleared of suspicion on two fronts -- he wasn't a Fed and he wasn't a Drug Kingpin -- and over time his interest in this unique form of folk art was vindicated. In time McCloud also began to produce his own images and his collection has shifted to a completely legal blotter art archive. Through Mark McCloud, blotter art was promoted at galleries and exhibits, earning him awards and accolades. In 1987, during a 20th Anniversary celebration of the Summer of Love, the San Francisco County Fair gave McCloud a ribbon for his "unusual but timely" exhibition. The Following year, 1988, McCloud hosted his Cure of Souls exhibit at the celebrated Psychedelic Solution gallery in New York City and this show, perhaps more than any other, gave blotter art a seat at the table for psychedelic art enthusiasts. In the two decades since the Cure of Souls exhibit, Mark McCloud's quirky obsession spread virally and many artists have adopted Blotter Art as a legitimate medium. If you or someone you know is interested in underground artwork, psychedelic artwork, or acid folklore, you will love collecting LSD Blotter Acid Art. Blotter Art is 100% legal. Blotter Art is ART! However, LSD is illegal, therefore there is no LSD present on any of the designs on ShakedownGallery.com.